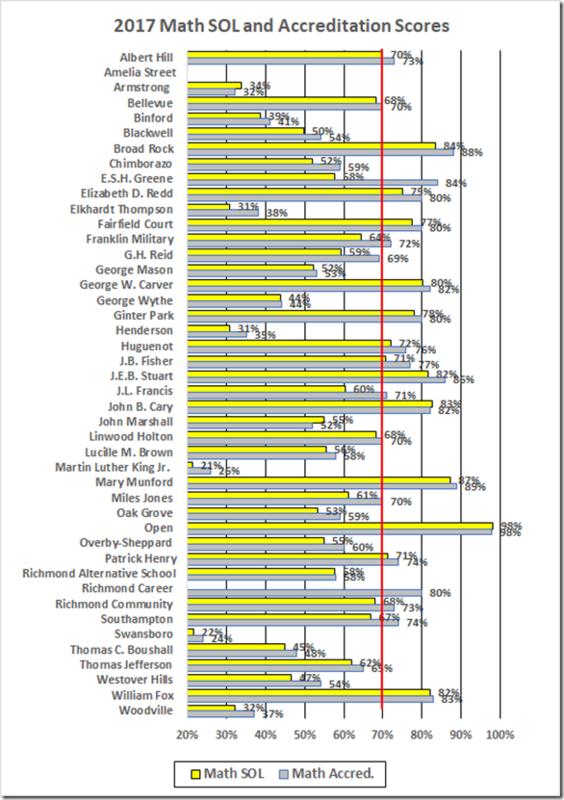 Having looked at the accreditation score boosts by division, let’s turn to the Richmond schools. As a reminder: The accreditation scores start with the pass rates. VDOE then applies “adjustments” for “remediation,” limited English proficiency, and transfer students. The result of the adjustments almost always is a boost in the score. Indeed, one division enjoyed a 26 point boost in its math score. Unfortunately, VDOE does not release the data that underlie these fudge factors so there is no way to audit the process. We can, however, look at the accreditation scores and compare them to the underlying pass rates. The red line is the 70% accreditation benchmark. This year Bellevue, Greene, Franklin, Holton, Francis, Jones, Community, and Southampton were boosted into math accreditation. The average math boost was 4%; the largest was 26% (!) at Greene. Imagine that! Greene had a 58% pass rate in math but managed to be fully accredited. With the Good Fairy handing out this kind of treats, it’s a wonder than anybody fails to be fully accredited. For sure, we have seen Atlanta, Buchanan County, Oak Grove, Petersburg, and VDOE’s own history in that respect. 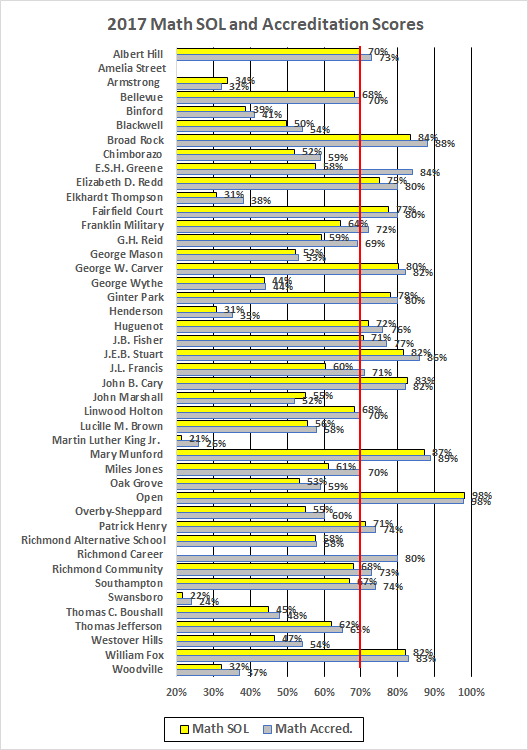 Viewed in that light, in the reflection of the demand for better pass rates, and in the context of the large boosts that some scores enjoy, VDOE’s secret data manipulation is ill-advised, even if it is not corrupt. P.S. : I’m holding off on the English data until I can learn how they average the reading and writing pass rates. If it’s by averaging the school averages for each subject, we’ll see a 30 point boost at Greene and a 31% jump at Armstrong. Stay tuned.